Path of Exile has entered its second phase of beta testing and Kiwi developer Grinding Gear Games would like your help testing it. Path of Exile immerses the player in a gritty and realistic art style that goes against the current industry trend of cartoony RPGs. 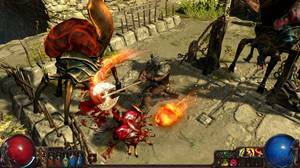 Path of Exile's combat is especially visceral, with plenty of blood and gore. Position matters a great amount in the combat system: you can dodge projectiles and be blocked in by monsters. The second phase of the beta brings with it significant balance adjustments, new arenas, skills and enemies. “Our goal with the 0.9.3 upgrade was to do a full rebalance of the game to make it even more fun. To achieve this, we’ve changed most game systems based on the feedback we received from testers. It feels like a whole new game now," said Grinding Gears’ Chris Wilson. Thanks to Grinding Gear Games, Gameplanet is giving away 30 beta keys. To be in with a chance to win, simply answer the question above!